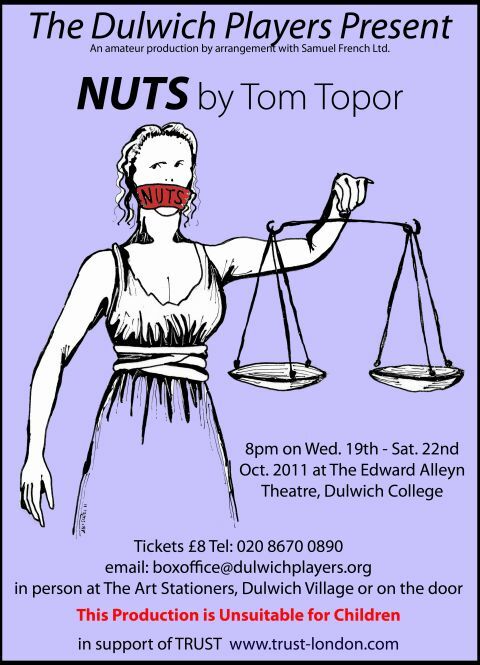 "Nuts" is based upon a real case in the USA where in the 1970s a prostitute, Claudia Draper, killed a client and her parents attempted to have her declared insane to avoid her standing trial for manslaughter. Faced with the prospect of indefinite incarceration in a mental institution, Claudia successfully appealed to a Tribunal and proved that she was fit to stand trial (and was subsequently acquitted on grounds of self-defence). 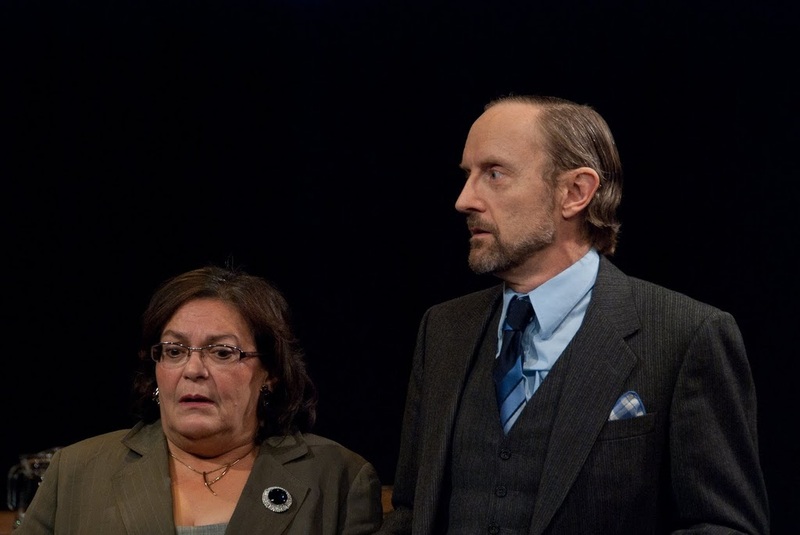 Tom Topor's play is set entirely in the Tribunal courtroom inside Bellevue Mental Hospital. 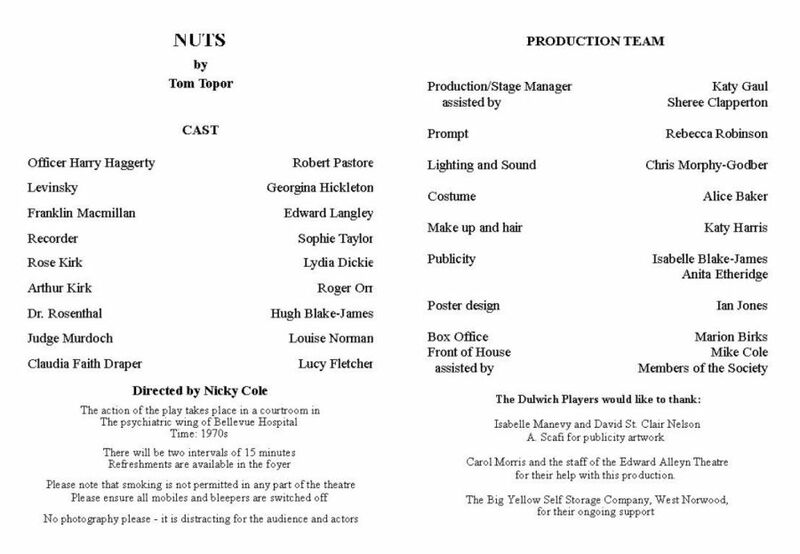 The Dulwich Players wisely decided not to attempt American accents, thus allowing the audience to concentrate entirely upon the dialogue's content, rather than being distracted by the manner of its delivery. Generally this worked well, though there was some incongruity when Claudia's seedy stepfather , played in an understated manner by Roger Orr, pleaded at length with his "baby" to forgive him, in phrases more in keeping with the mid-West than the West Midlands. 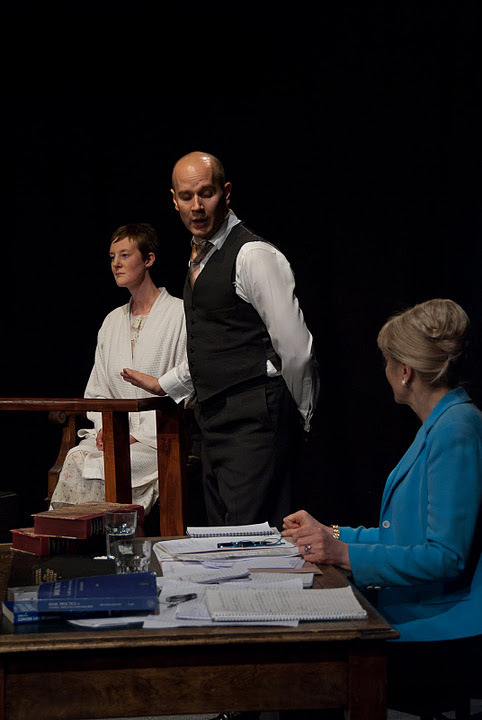 As a court-room drama, the play is necessarily static, so Nicky Cole's direction subtly encouraged the actors to introduce as much movement as the staging could allow. The characters not immediately involved in the dialogue were also suitably reactive to what was being said, thus focusing the audience on the increasing tension built into the plot. Unfortunately, this tension was difficult to sustain, given the insertion of two intervals and, on the opening night, the high number of audible prompts. The final verdict of the Judge, played with suitable authority by Louise Norman, came also as something of an anti-climax, apparently owing more to the State Attorney's unwillingness to accept an independent psychiatric assessment of Claudia than to her having proven beyond doubt that she was sane. 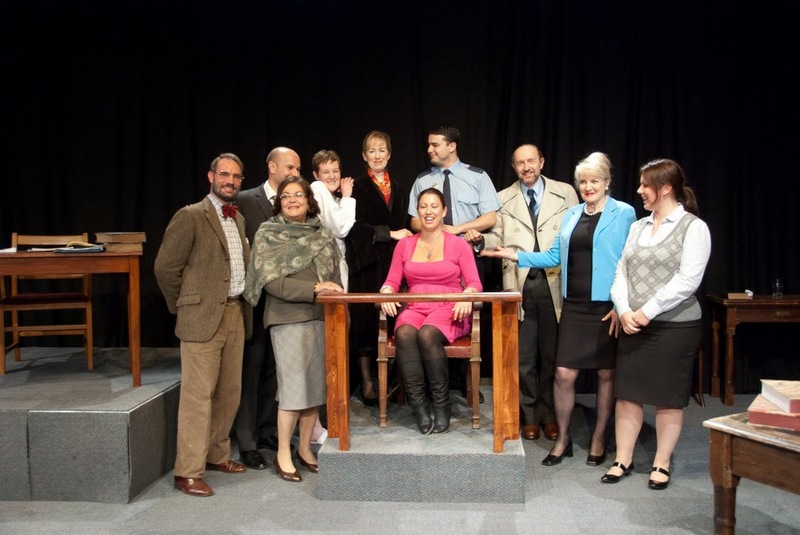 The play does come to life in the Third Act, when Claudia takes the witness stand. This is the first time the audience has heard much from Claudia, other than the occasional aside to her lawyer and brief rants against her parents and the State Attorney. She has hitherto given every appearance of the twitchy neurotic, in her hospital dressing gown and slippers, accusing everyone of conspiring against her, very much the paranoid schizophrenic that the hospital psychiatrists have diagnosed, unable or unwilling to accept that people are acting in her best interests. Now, at her own insistence, she takes centre stage and delivers a series of home truths to everyone in the room, together with a graphic account of her lifestyle choices and the sexual services she performs. This was a brilliant, compelling performance by Lucy Fletcher as Claudia. From the early nervous mannerisms, through the sarcastic put-downs of her mother and step-father, to the final vitriolic condemnation of those indeed conspiring to lock her away forever, Lucy was totally believable and earned the solidarity (rather than sympathy) of the audience. The Tribunal hearing is life-changing not only for Claudia. Her mother, Rose, learns that her husband has offered money to Claudia to keep quiet about his perverted insistence on bathing his pubescent step-daughter. Lydia Dickie's interpretation of Rose was at times deeply moving, revealing her character to be torn between her instinctive love for her daughter and her dutiful support for her husband's claims that they were acting in Claudia's best interests (and their own, since a trial would bring down upon them the public shame of their daughter's prostitution). Rose's reconciliation with her daughter and ultimate disillusion with her husband (in real life they divorced soon afterwards) was portrayed with beautifully-expressed compassion and dignity. Few characters emerge well from the proceedings. Dr Rosenthal, the chief hospital psychiatrist, is at first obnoxiously self-important and mindful of his status. He is later shown to be less than thorough in his analytical technique, a self-styled expert witness whose readiness to certify schizophrenia on the basis of a single 50-minute interview leaves him ultimately discredited. 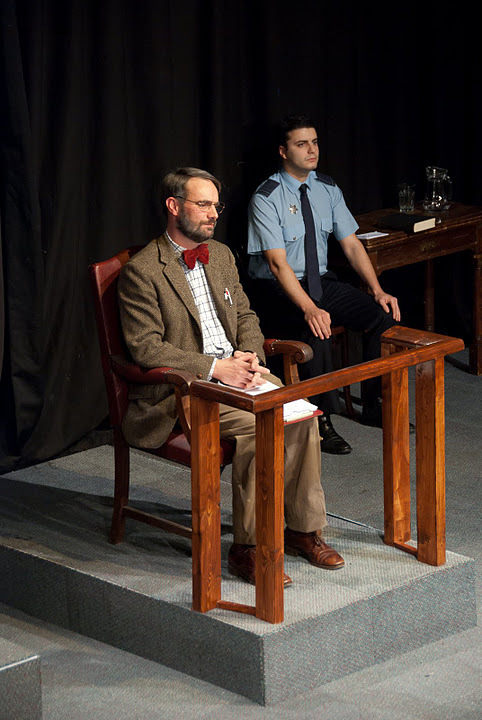 Hugh Blake-James brought just the right amount of bluster and pomposity to the part, his body language portraying the sense of outrage and discomfort as he was ultimately recalled to the witness stand. 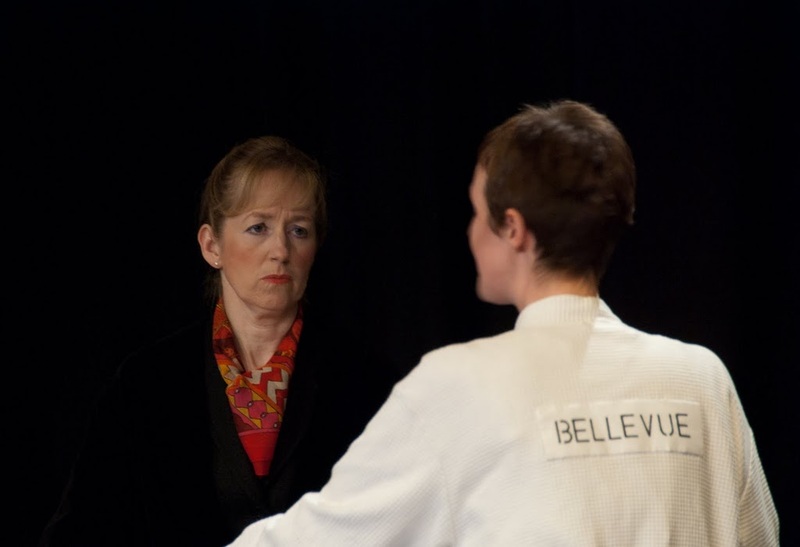 The two opposing Attorneys, played by Ed Langley and Georgina Hickleton, move the play along and exchange barbed remarks as they battle for supremacy. The pace dropped on occasion, as they seemed at times hesitant in their questioning, but both actors made the best of some very good lines which underlined the somewhat Kafka-esque nature of the proceedings. Chris Morphy-Godber's lighting was most effective when spot-lights were focussed on the witnesses at key moments, creating a certain atmosphere. Perhaps greater use of lighting variations (and only one interval) would have helped to build the required amount of tension in a court-room drama that, ultimately, needed a touch more drama.